A horrific accident involving a trailer and three electric bicycles last month - which killed two riders and injured the third - has put e-bikes in the spotlight once again. It is easy to get carried away and say we should do this or that - including banning such contraptions - to prevent more loss of life and limb. But there is a danger of throwing the baby out with the bath water in the process if we are not careful. First of all, some perspective. Accidents happen. And more often than not, riders bear the brunt in a collision - be they cyclists, e-bike riders or motorcyclists. Pedestrians too are particularly vulnerable. Unlike occupants of a car, van, bus or truck (excluding those who occupy the open deck), they are not shielded. Statistics show as much. Between 2004 and last year, the number of fatal and injury accidents involving motorcycles numbered 55,896. That translates to 33 per cent of all such road accidents - inordinately high given that motorcycles account for only 15 per cent of Singapore's vehicle population. So, should we ban motorcycles then? Obviously, not. We should take the recent accident as another wake-up call to take a closer look at what is a fast-evolving world of wheels. 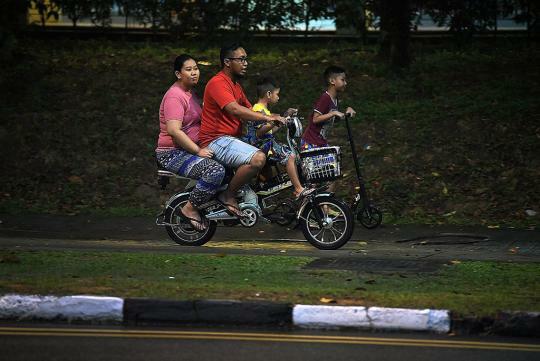 Bicycles, e-bikes and other similar devices are fast becoming a significant part of the mobility landscape as Singapore encourages "active mobility". Statistically, their proliferation is likely to be followed by a rise in accident cases. According to the Traffic Police, there were 6,327 fatal and injury accidents involving bicycles and e-bikes between 2004 and last year. The number, which translates to 3.7 per cent of all such accidents, does not include cases which occur on pavements and elsewhere. It covers only road incidents. The Straits Times has asked repeatedly for off-road statistics, but none of the agencies and the ministry involved has disclosed them. But even if we look at the road figures alone, a worrying trend emerges. Last year, fatal and injury accidents involving bicycles and e-bikes rose for the second consecutive year to hit a 12-year record of 643. While the data does not tell the full story without a bicycle population figure (bicycles and e-bikes are not required to be registered here), it is still a useful indicator. It shows the accident figure climbed 38 per cent from 2013. Also, the figure was almost 25 per cent larger than the average for the preceding 11 years. If cases involving e-scooters, e-skateboards, e-unicycles and other personal mobility devices - motorised or manual - are included, the figure is likely to be significantly higher. And because these devices are going to be more prevalent very quickly - thanks to technology, e-commerce and competition - it is imperative that Singapore comes up with a holistic framework to regulate all forms of mobility contraptions soon. There are already 11,600 e-bikes here. The figure excludes the illegal, unlicensed vehicles. It also excludes the myriad of other mobility devices, which are likely to have overtaken e-bikes in numbers. Last month, The Straits Times reported that e-scooter sales were soaring, with one distributor saying it was selling more than 400 units a month. If that is so, it means 4,800 units a year. And that is just one retailer. These devices are available literally everywhere, from hardware stores to supermarkets to malls. And going by those we often see on the road, on pavements and on park connectors, most are modified to go faster than the allowable top speed of 25kmh. First, we must recognise that all of these devices serve a crucial role in getting people from point A to B, and are part of the huge mobility universe which encompasses buses, trains, taxis, motorcycles and, yes, even cars. So banning them is out of the question. The Land Transport Authority (LTA) has already put in place some rules to regulate them, such as restricting speed, weight, power output and, in the case of e-bikes, banning those with a throttle. But clearly, there is more to be done. It is one thing to produce rules and regulations, and another to publicise them clearly and loudly. Enforcement must be in place to ensure users abide by those rules and regulations. One practical measure is to ensure that only machines which meet regulations are imported. This will go a long way in making enforcement easier. This measure will, however, require inter-ministerial cooperation. Hydra if nothing is done to curb the importation of parts used in modifications. At the same time, users should be informed about the perils of modification - whether done on e-bike or e-scooter. Most, if not all, modifications focus solely on raising power output. Other components, such as the brakes, are left untouched. Such machines will not have sufficient braking power, especially in an emergency. Or their battery management system could go wonky, rendering a sudden loss of power, which again will spell doom in an emergency. As with all road safety initiatives, enforcement must be accompanied by education. Users must recognise that they are not easily visible because of their relatively small footprint. Drivers of heavy vehicles, who already face many blind spots, will be doubly hard put to spot a rider attempting to squeeze in between him and another vehicle or the kerb. All riders, not just e-bike users, must be made to realise this. They should also be required to wear helmets and have adequate illumination at the back and front. At the same time, such illumination must not blind other users. Rules governing the use of phones and other handheld devices which apply to drivers must apply to the new breed, too. It is a daunting and unenviable task for lawmakers and regulators, but it is absolutely necessary that they get it right. More so now that we are proposing to allow bicycles and mobility devices on the pavement. Separately, this will call for a seismic shift in culture, norms and mindset on the part of the public. Throw a people who are not known for their graciousness into the mix and we have volatile situations filled with frayed nerves, bruised knees, or worse. Because even with current regulations, an e-scooter with a top speed of 25kmh can still do a lot of damage if it hits a pedestrian. But again, the same can be said of a bicycle. It does not help that our pavements are generally narrow. Plans to double the cycling path network to 700km by 2030 will help, even if it is 14 years away. And work will start by the year end on a 150km round-island park connector, which will link the current 300km network. Hopefully, over time, pedestrians, mums pushing prams, old folk in wheelchairs, cyclists, food delivery bikers, e-scooter riders and everybody else getting from here to there will learn to live and let live. Until then, it is clear the State must do more.